The Toronto Blue Jays claimed Jesus Montero off waivers, bringing an end to the Mariner career of a player who never reached the heights the team expected after acquiring him in a 2012 trade. 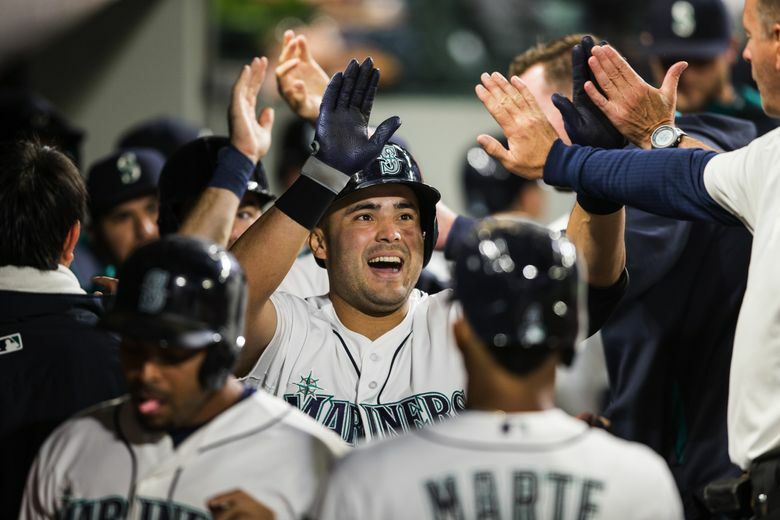 PEORIA, Ariz. — If Jesus Montero ever lives up to the potential that compelled the Mariners to make him the centerpiece of a trade in which they dealt their top pitching prospect to the Yankees, it will happen somewhere other than Seattle. A couple days after the team designated Montero for assignment, he was claimed on waivers Monday by the Toronto Blue Jays. The move closed a four-year run that only briefly lived up to the hype that accompanied his arrival in a 2012 trade that sent Michael Pineda to New York. The writing on the wall for Montero seemed apparent when Dipoto, after being hired in September, traded for Adam Lind and signed free agent Dae-Ho Lee to compete for the right-handed platoon job at first base. Montero was beaten out by Lee after hitting .237 in 38 at-bats this spring. He struck out 12 times. Though the Blue Jays claimed Montero, it’s unlikely there will be a 25-man roster spot available for him there. Toronto likely will try to sneak him through waivers so he can be outrighted to the minor leagues. Had he not been claimed, Seattle would have sent Montero to Tacoma. But for now, his Mariners days are done. The trade that brought Montero, 26, to Seattle was one of the most significant deals made by previous GM Jack Zduriencik. Montero came to the Mariners with pitcher Hector Noesi for Pineda — who made the All-Star team in 2011 — and Jose Campos. The Mariners thought Montero would add power to the middle of the lineup and solidify a catching spot that has been a revolving door for years. Early in his career Baseball America had named him the Yankees’ “Best Power Hitter’’ in their organization and in 2007 he was the magazine’s No. 6 overall catching prospect. But a few months after Zduriencik was fired, Montero joined him out the door, serving as maybe the most visible symbol of a doomed era in Mariner history. The beginning was promising, as Montero hit .260 with 15 home runs in 2012 and caught a combined no-hitter against the Los Angeles Dodgers on June 8. Montero’s troubles began the following season when the team sent him to Tacoma early in the year to learn how to play first base. He suffered a knee injury that held him out for six weeks and then was suspended 50 games for violating baseball’s drug program. His issues, well, ballooned the following year as he showed up to 2014 spring training roughly 40 pounds heavier. He admitted that “all I did was eat’’ in the offseason and earned a sharp rebuke from Zduriencik. More embarrassment came that season, as Montero was suspended late in the year after getting into a verbal altercation with a scout at a Class A game while on a rehab assignment at Everett. Montero showed up to camp in 2015 slimmer and apologetic, losing more than the 40 or so pounds and he had gained, vowing to redeem himself. He began the 2015 season in Tacoma, and his performance raised hope that maybe he’d live up to his apparent promise, as he hit .355 with 18 home runs. The average was the highest in Tacoma history. But he struggled in stints with the Mariners, hitting .223 with five home runs in 112 at-bats. With Zduriencik gone, 2016 loomed as a make-or-break year for Montero. He showed up this spring appearing to have put on a little bit of of the weight he’d lost, and he never found his stride at the plate. A few days ago, he said his goodbyes to teammates after being told a move was coming. Moving Montero off the 40-man roster means the Mariners can add reliever Joel Peralta, a 40-year-old who has won a spot on the team’s opening-day roster. The grand offensive total of Montero’s Mariner career? A .247 average in 745 at-bats with 24 home runs and 92 RBI.